I decided to write this article after attending the 2016 Gooch’s Garlic Run. This is an event held in Northern New Jersey every June to benefit needy families. I try to attend annually. It’s a lot of fun to walk around and watch the activity. It’s also interesting to see what mounts are deployed. Some good. Some really bad. It’s time for an article on good inexpensive motorcycle cell phone mounts. Motorcycle riders like to mount a lot of devices. Phones, cameras, drinks, satellite radios. Didn’t see anyone mounting any tablets this year but have seen a few Apple iPads deployed in previous years. Unfortunately I see things mounted in careless ways. I saw an Apple iPhone with twist ties. I saw a Sirius Radio attached with Velcro. I saw a lot of poorly made mounts made for bicycles holding expensive phones such as an Apple iPhone 6s and Samsung Galaxy S7 models. The difference between a bicycle mount and one made for motorcycle use is the durability. A bicycle mount isn’t made to withstand the vibrations of a motorcycle. It’s a good way to lose your phone. A good affordable motorcycle cell phone mount has several qualities that separate them from a poorly made bicycle mount. Mounts made for a motorcycle are more rugged than one made for a bicycle. There will be an expandable cradle or case that doesn’t open unintentionally and the phone must be secured with a safety tether or screw. Since we are concentrating on good inexpensive motorcycle cell phone mounts, they aren’t likely to made of metal, that’s going to move it out of the inexpensive category. So let’s look at some good inexpensive motorcycle cell phone mounts. All meet our criteria of made for motorcycle use with inclusion of a safety strap or screw. See the photo that accompanies this article? 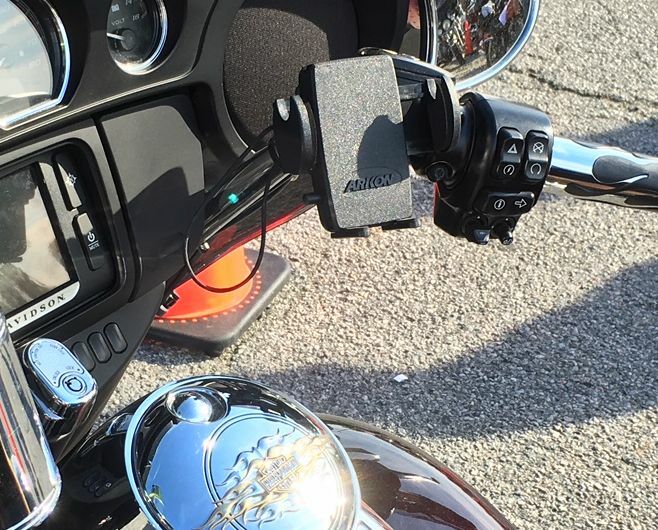 That’s the Arkon Mega Grip Smartphone Handlebar Mount mounted on a Harley-Davidson. This mount includes a handlebar mount made to fit up to 1.25 inches diameter. It attaches with two included bolts using a screwdriver. There is an included rubber strip that should go between the handlebar and mount to prevent marking up the chrome. The expandable cradle opens to 3.4 inches which is large enough for almost any phone with or without a case or skin. There are support feet at the bottom of the cradle that can be removed, but I recommend they remain for added security and stability. The included safety tether wraps around your phone to help keep it mature. The phone will rotate into landscape or portrait. This mount carries a two-year manufacturer warranty. The Arkon Handlebar Phone Mount with Water-Resistant Holder is an interesting entry for a good inexpensive phone mount. This is great for use during inclement weather. The same handlebar mount as the prior configuration is used so it’s going to fit handlebars up to 1.25 inches. The included weather-resistant holder holds phones up to 5.95 x 3.12 x .33 inches. The case zippers shut and has a port near the bottom for running cables. Instead of a safety tether, the case has an added safety screw on the back for attachment to the mount itself. The case will swivel 360 degrees. This also carries a two-year warranty. The last good inexpensive motorcycle cell phone mounts we recommend is the Aduro U-GRIP PLUS Universal Handlebar Mount for SmartPhones. This mount fits handlebars up to 1.5 inches diameter. There are included rubber strips for smaller handlebars. The rubber strips are useful for preventing any scratches on the handlebar and I suggest they be used. It secures using an included wrench. The expandable cradle opens to 3.375 inches. This mount includes a silicone safety tether that wraps around the edges of the phone and attaches to the mount. These are three good inexpensive motorcycle cell phone mounts that I feel comfortable recommending. These are well made, include a safety mechanism like a tether or screw and a universal holder be it a cradle or case.